Located within the Green Valley Ranch Resort and Spa, Hank’s Fine Steaks offers a modern, sophisticated setting where patrons may indulge in a premium variety of different American favorites. Begin with one of seven different ocean-oriented appetizers or choose from several soup and salad selections before moving on to an assortment of satisfying entrees. With an emphasis on fine cuts of steak, Hank’s procures beef from Niman Ranch and Greater Omaha to provide nine different cuts. With both on the bone and off the bone selections, aged prime rib, and cuts for two like the 35 day dry aged, Niman Ranch T-Bone, selecting the right steak is a breeze. The menu also features a series of seafood specials as well as several entrees including the signature Wagyu Burger, fried or rotisserie chicken, pork, and veal or lamb chops. 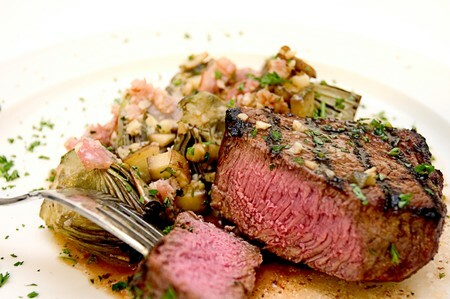 Hank’s Fine Steaks is open for dinner nightly at 5:00p.m. and reservations are recommended. Happy Hour at the bar begins at 4:00p.m.